One man’s search for a long-lost locomotive has led to it being lovingly restored by a team of volunteers – and now the public can view its progress in a series of online videos. From working on the tracks at Fry’s Somerdale chocolate factory in the 1920s, to narrowly escaping the scrapyard, the rusty Sentinel Shunter was re-discovered by Eric Miles – a former engineering apprentice at the factory – after he refused to give up on his five-year search for the locomotive, built in 1928. He brought the engine back to the West Country in 2009. The volunteers restoring the locomotive to how it looked in its heyday, created the short films which follow the little engine on its 86-year journey. It is now in the care of Avon Valley Railway. 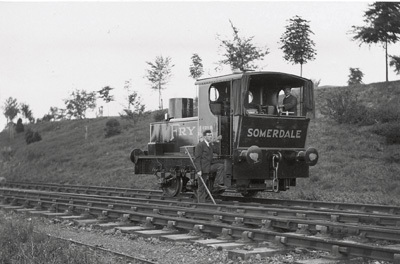 In the first film, “The Somerdale Shunter”, Mr Miles explains how he was amused to see the little engine “pottering about” at the factory when he arrived for a job interview, before being offered his apprenticeship. He said: “It wasn't long before I was around the back of the workshops, flagging down the loco and persuading the driver to let me ride on the footplate up to the Keynsham crossing. Five films have been put together by the team. The first three – “The Somerdale Shunter", “The Hunt” and “Return to Somerset” – are all available to view now. The finishing touches are being made to the next two installments – “How the Sentinel Works” and “Restoration Update: Winter 2013” – which are expected to be online soon. During restoration, all the locomotive’s panels, fittings and pipes were removed and several new panels manufactured for the cab and coal bunker, as well as a new cover for the engine. Painting and reassembly is now under way before the team remove the boiler for inspection to see whether it needs repairing or replacing. John Lanchester, commercial director at Avon Valley Railway, said the team was delighted to be able to share progress on the project. He said: “The Fry’s Sentinel’s story is a remarkable tale of survival, with the best years of its life spent in the West Country – first at Somerdale and now here at Avon Valley Railway. The films can be viewed online by visiting youtube.com and searching “The Somerdale Sentinel Story”. For news and events at Avon Valley Railway, including Easter Eggspress services and Diesel Gala in April and Family Fun Weekend in May, visit www.avonvalleyrailway.org.